This is really FUN! 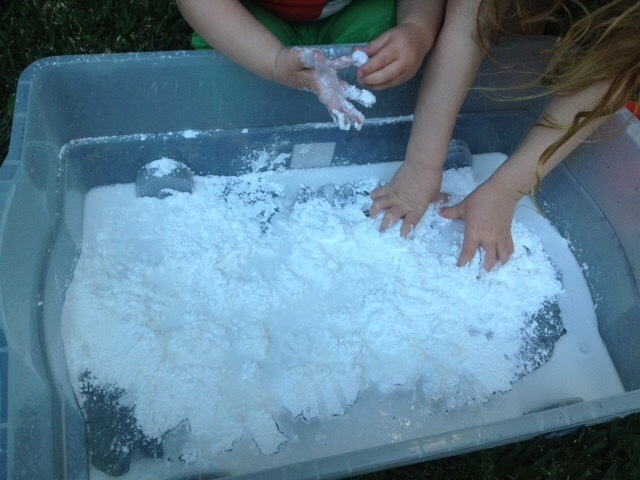 Messy play for kids of all ages, and adults too. You might want to wear aprons, but the great thing about cornflour is that it washes out of clothing really easily, so don’t worry too much if the kids get plastered in it… Which my toddler did, from head to foot! Babies as young as 6 months can enjoy getting messy with it and experiment with the feeling of the mixture between their fingers and toes. It’s completely safe and non-toxic too, so it’s not the end of the world when it inevitably makes its way into their mouths. For the brave mums out there (and those with slightly older children) you could also add food colouring, but this won’t come out of clothes so easily and you may end up with a baby with green face and hands! Have fun with it and watch their little faces as the solid cornflour balls literally melt in their hands. Brilliant! We’ll be doing this a lot in the garden once the weather gets warmer.